but enough about that. I have a backlog of stuff to write about, so today I'm gonna start with God of War. I play a lot of videogames. It's my primary hobby, so if you're reading this and wondering if the rest of my posts will be about this, the answer is probably. Moving on. The series is loved by anyone who plays it, so when I'm asked about it I kinda feel bad saying I think it's okay at best. It is true that the presentation is nothing short of epic. Nothing beats jumping on top of a giant cyclops, jamming your blades into his eye and ripping the eye out. But I don't really think that is what makes a game good.It sure helps, but its not enough. Short of pressing O or X when prompted, the player is not really involved in the process with regard to the buttons that he or she must press, and I think a lot of that feeling comes from the fact that I have Devil May Cry, a very similar game that, in my opinion is much better, to compare it to. The reason is that the buttons you must press to pull of a "move" in God of War are much simpler. You press something like OOXXO and Kratos pulls off a combo move. 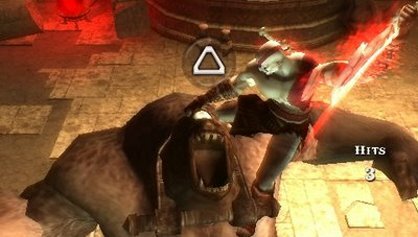 Sometimes, a giant O or X floats above the enemy, you press the button and Kratos jumps on him. A second X appears, and when pressed Kratos rips the demon's head off or something. The spectacle is nothing short of draw-dropping, and the best animation of its kind in the field of games. You truly feel awesome. But, when it's all over, I don't really feel like I did anything to make that happen. In Devil May Cry, you have the triangle button and square buttons, and the R1 button for uppercuts. A combo in DMC goes something like TTT, hold R1 and press back while hitting T, SSS, X, L on the D-pad, OOO, and it can go on and on. The player is frantically trying to keep it going while keeping it inventive and not overlapping attack patterns, using every weapon available. It is much more stylized when compared to GoW, which I would rather call "brutal". God of War is satisfying yes, but the actual process of beating up common enemies is much more fun and involving in DMC. This is, of course, just my opinion. Obviously a game has to be some kind of good to gain popularity and God of War is NOT a crappy game. But this kind of makes me curious: Why doesn't DMC see much coverage from media or get the same fame?